This model can dispense four different coffee dosages from each brewing head and is also equipped with independent semiautomatic override switch in each group. 10 LBS FREE ESPRESSO WITH EVERY MACHINE PURCHASE! THE INSTALLATION OF YOUR MACHINE BY A TRAINED TECHNICIAN IS ALREADY INCLUDED IN THE PURCHASE PRICE. 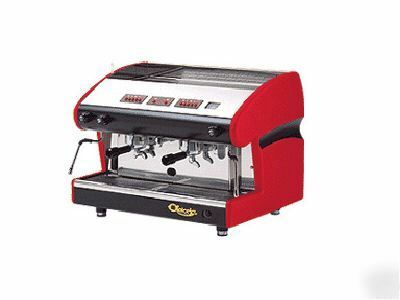 WE WILL ARRANGE FOR YOUR MACHINE TO BE INSTALLED AT NO ADDITIONAL CHARGE SO AS NOT TO VOID THE FACTORY WARRANTY. Outer Body: Baked enamel steel with painted ABS side panels connecting hoses, rechargeable water softener and three portafilters supplied with machine (one single, and two double spouts). It is your responsibility to inspect your item for concealed damage immediately after you receive it. You should open the item during delivery and note any internal damage not noted on the Bill of Lading. Any and all damaged equipment must be documented with the freight driver before the driver departs your location. Also, freight companies accept hidden damage claims only for a short period after delivery, usually 15 days. Warranty is subject to installation by a certified and approved technician with the approval of PT's Coffee, GEE, the warrantor, and General Espresso Equipment Corporation. Warrants cover the original purchaser/user. Warranties cover the above machine to be free from defects in factory materials for the period of one year from the units installation date. The Warrantor agrees to supply at its option similar parts, for any parts excluding filters, shower plates, group gaskets, and tap gaskets. Any replacements under the one-year warranty will be without cost to the original purchaser/user except for labor and labor-related transportation charges occurring 90 days after installation. The warrantor shall not be responsible for any expenses incurred for service or repairs during the 90 day period following installation performed by any persons or persons other than the warrantor, unless specifically authorized by the warrantor. Service calls or repairs other than those covered by the conditions set forth in this warranty will be made at the expense of the purchaser/user. All sales are final. There are no returns, refunds, or cancellations. If PT’s Coffee Co. agrees to make an exception and allow a return, allow a cancellation or approve a refund, PT’s Coffee Co. reserves the right to charge a fee up to 25% of the order total. - The staff at PT’s Coffee Co.